Move the phrases and modifiers by changing the passive voice to active. It is the simplest technique to make any kind of content unique. Read the whole passage with full concentration and understand it. then, create the unique content by writing what you’ve understood from every passage. Keep the same meaning of each sentence by using negatives or reversals. For instance, you can write “it is impossible” as “it is not possible”. Using lengthy paraphrases. Content paraphrase involves explaining the writers work in your own words but maintaining the central ideas. But some writers fall prey when they use a too lengthy paraphrase of a paper. As techniques for paraphrasing, you should make the work about the same length or slightly smaller than the original work. Juxtaposing word for word. Content paraphrase goes beyond replacing one word with another synonymous word. As techniques for paraphrasing, you need to know how to convey the same message using a different set of words and phrases. It involves paraphrasing a sentence, paragraph or text. Not acknowledging sources. To paraphrase you need to acknowledge the source of the original work and sticking to the central idea. Not giving credence to an author’s work could be considered plagiarism. Distortion of meaning. By attempting to make the work look original without giving credence some writers try had to the point of making the lose its original meaning. Also for content paraphrase, using inappropriate synonymous words can make a paper or article loses its actual meaning. Personal opinion. More techniques for paraphrasing revolve around the fact that you need to stick to the original line of thought and not introduce personal opinion when paraphrasing a sentence, paragraph or page. There is an example of paraphrasing sentences that will teach you to reword the content properly. For example, the good paraphrased version of “I wanted to be a part of your wedding ceremony” is “I planned to attend your wedding event”. The bad paraphrasing example of “This was my biggest mistake to trust you” is “It was my largest blunder to believe on you”. This is a clear difference that shows how to paraphrase properly. This example of paraphrasing sentences would be quite helpful for you to understand the actual way of changing the words without affecting the meaning of the content. You can do it by yourself without hiring any firm for the assistance of paraphrasing. The badly paraphrased sentences would result in rejection of your content. 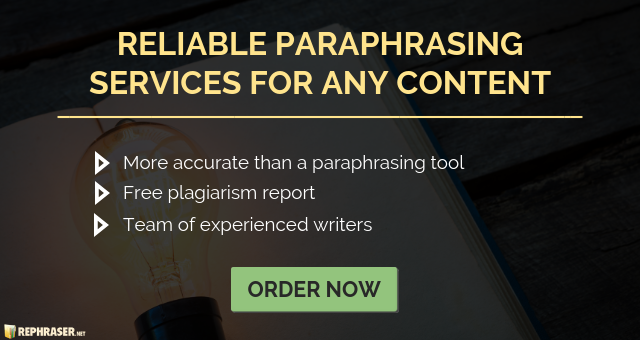 You can save yourself from poor grades if you’re a student by relying on useful tips for paraphrasing the content or order good online rephraser help. Time wastage is a fact and reality more than a myth. Employers, on one hand, believe they should get value for the money they pay employees as salaries. Employees, on the other hand, think they have a right to privacy. Employees also think employers should cut some slacks and be trusted to do their work efficiently without overtly monitoring their actions. Regulatory bodies also think both parties should be fair to each other while again upholding the rights and privacy of employees. Wasting time is a reality more than a farce. Chief executives and managers believe they must receive efficient workflow as value for the salary they pay employees. Employees believe their privacy is a right. Employees also think employers should trust them to do their work and stop monitoring their actions. Regulatory bodies, on the other hand, suggest both parties need to be fair while still speaking about rights and privacy. Time, efficient service delivery and respect for employees are three critical factors where employer-employee relations come to the front burner. Employers argue for effective management of employees to ensure more productivity as a justification for salaries paid. Employees argue for better understanding, preservation of their rights, and privacy as against office-policing. The regulatory body as an arbiter thinks all should fight and play fair but respect each other’s rights, and privileges. Make sure that you write the content in your own words by avoiding to copy the existing phrases. It also helps a lot to improve your vocabulary. Place the words in quotation marks if you use any phrases that are in the original quote. Remember that your written content is the actual concept of someone else. You need to add a citation for it. Start improving vocabulary skills. Make a short list of words and quote’s main ideas if you’re having difficulty in paraphrasing. All the words and concepts must be incorporated into your phrases. This list is quite workable for everyone. The best techniques for paraphrasing content can save your time and money. Read the most workable tricks that can make you able to create 100% unique content.